Listen to the podcast. Find it on iTunes. Read a full transcript or download a copy. Sponsor: Ariba. 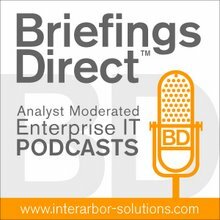 This latest BriefingsDirect podcast, from the 2013 Ariba LIVE Conference in Washington, D.C., explores Ariba's product and services roadmap and future strategy insights unveiled by Ariba, an SAP company, at the recent user event. Our guest is Chris Haydon, Vice President of Solutions Management for Procurement, Finance, and Network at Ariba, here to explain the latest conference news, and to offer insights into how Ariba will be broadening its services procurement management value, mobile push and AribaPay roll-out. Gardner: Where we are now with Ariba in terms of some of the big news at LIVE? Haydon: We have some really exciting innovation coming in the near-term to Ariba in a couple of areas. First, let's talk about Network RFQ or the Spot Buy. We think this is part of the undiscovered country, where, according to The Hackett Group, 40-plus percent of spend is not sourced. By linking this non-sourced spend to the Ariba Network, we think we're going to be able to address a large pain-point for our buyers and our sellers. Network RFQ or Spot Buy is a near-term solution that we announced at LIVE, and we're bringing that forward over the next six months. The next exciting innovation is at the other end of the process. That’s a solution we call AribaPay. AribaPay is what we think is a game-changing solution that delivers rich remittance and invoice information that’s only available from the Ariba Network through solution secure, global payment infrastructure. Gardner: It seems to me, Chris, that you're going to the mid-market. You're creating some services with Spot Buy that help people in their ad-hoc, low-volume purchasing. You're providing more services types of purchasing capabilities, maybe for those mid-market organizations or different kinds of companies like services-oriented companies. And, you're also connecting via Dell Boomi to QuickBooks, which is an important asset for how people run small businesses. Are we expanding the addressable market here? Haydon: We are, and that’s an excellent point. We look at it two ways. We're looking to address all commerce. Things like the Spot Buy, AribaPay, services, procurement, and estimate-based services are really addressing the breadth of spend, and that applies at the upper end and the lower end. There are important pieces that you touched on, especially with our Dell Boomi partnership and the announcement here for QuickBooks. We want to make it accessible to grow the ecosystem and to make the collaboration across the network as frictionless as possible. With Dell Boomi announcing QuickBooks, it enables suppliers specifically with that back-end system to be able to comply with all the collaboration of business processes on the Ariba Network, and we're really only just getting started. We want our customers on both the buy-side and the sell-side of their partners to make their own choices. There is a massive ecosystem out there with QuickBooks, but when we have a look around, there are more than 120 prominent backend systems. So it's not just the SAPs, the Oracles, the JD Edwards, and Lawsons. It's the QuickBooks and the Intuits. It's the Great Plains of the world. Think about at it as back-end agnostic. We want our customers on both the buy-side and the sell-side of their partners to make their own choices. It's really their own choice of deployment. If they want to take an integrated business-to-business (B2B) channel, they can. If they want to come to a portal, they can. If they want to have an extract that goes into their own customized system, they can do that as well, or all of the above at the same time, and really just taking that process forward. Gardner: How does AribaPay work? Is this a credit card, a debit card? Is this a transactional banking interface? Haydon: Number one, it's brand-new. First, let's talk about the problems that we had, and how we think we are going to address it. More than 40 percent of payments in corporate America are still check based. Check-based payments present their own problems, not just for the buyers, but also from the sellers. They don’t know when they're going to get paid. And when they are getting paid, how do they reconcile what they're actually getting paid for? AribaPay is a new service. It's not a P-Card. It's leveraging a new type of electronic payment through an ACH-styled channel. It enables buyers to take 100 percent of their payments through the Ariba Network. It lets the suppliers opt in to be able to match and move from our paper-based payment channel check, to an electronic channel that is married. This is the interesting value prop for the network. That is married with their rich information. So that’s the value. We think it's very differentiated. We're going to be leveraging a large financial institution provider who has great breadth and penetration, not just here in the United States, but globally as well, and that's via Discover Financial Services. We announced this at LIVE this month, and I know they're as excited as we are. Discover has the wherewithal to bring the credibility and the scale to the payments channel, while Ariba has the credibility in the scale of the supply base and the commercial B2B traffic. We think that that one plus one equals three and is a game changer in electronic payment. Gardner: Moving on to the future or vision that you're painting, what should we expect in the roadmap of the next two or three years for the Ariba Network? The ability to apply your own business rules and logic to those collaborations is massive. Haydon: We're really excited about the Ariba Network and we have four or five themes. One piece of big news is that we're getting into and supporting supply chain and logistics processes, and adding that level of collaboration. Today, we have 10 or 11 types of collaborations that you can do on the Ariba Network, like an order, an invoice, and so on. Over the next several releases, we're going to be more than doubling that amount of collaboration that you can do between trading partners on the network. That’s exciting, and there are things like forecasting and goods receipt notices. I won’t go into the specifics of every single transaction, but think about of doubling the amount of collaboration that you can do and the visibility in that. The ability to apply your own business rules and logic to those collaborations is massive. The second thing we're doing on the network is adding a new spend category, which we call services invoicing. This is estimate-based spend and this is another up market, down market, broad approach, in which there are a whole heap of services. This is more of an estimate-based style spend where you don’t necessarily know the full cost of an item until you finish it. Whether you're drilling an oil well or constructing a building, there are variations there. So we're adding that capability into the network. Another area is what we call Network 2.0, and this is extending and changing not just the user interface, but extending and adding more intrinsic core capabilities to the network. Ariba has a number of network assets and we think it's important to have a single network platform globally. It's the commerce internet, the network. So our Network 2.0 program is a phase delivery of extending the core capabilities of the Ariba network over the next couple of years in terms of order status, results, requests in terms of goods receipt notices, advanced shipping notices, more invoice capability, and just growing that out globally. Last but not least is just more and more supply collaboration, focusing on the ability for suppliers to more easily respond, comply, and manage their profiles on the Ariba Network. Gardner: The Ariba applications themselves, what should we expect there? Haydon: We have a whole raft of capability coming across that whole application suite. We can break that into two or three areas. In our sourcing, contract management, supplier information management, and supply performance management suite, we're doing functionality enhancements on one of the exciting pieces. We're introducing a new look and feel, a consumer like look and feel, to our catalog and our search engine. In the spend visibility area, we're going to be leveraging the SAP In-Memory technology HANA. What we are doing there is early for us, but there are some very exciting, encouraging results in terms of the speed and the performance we've heard about from SAP. Running our own technology on that and seeing the results is exciting for us and will be exciting for our customers. As we move more into our procurement suite, we're introducing a new look and feel, a consumer like look and feel, to our catalog and our search engine. The more Amazon-style search touches more users than anyone else. As you can imagine, that’s how they need to requisition tools. So making that a friendly UI and taking that UI or user experience through to the other products is fantastic. One of the other most exciting areas for us is services procurement, a very large investment for us. Services procurement is our application to be able to support temporary or contingent labor, statement of work or consulting labor, print, marketing and also light industrial. This really is one of the underpinning differences for Ariba, and this is where we're bringing it together. We're not just building applications any more. We're building network-centric applications or network-aware applications. It means that when we're launching our new services procurement solution, not only are we are going to have a brand-new, refreshed, modern user interface, which is very important. We're going to be able to leverage the power of the Ariba Network to provide differential insights, into standard day-to-day services procurement on-boarding. That will be looking at average labor rates in the area for the type of service that you're buying and using the network intelligence to give you advice, to give you instruction, to help you manage exceptions on the network. Gardner: What’s really interesting to me is all of your vision so tightly aligns with the mega trends of today, from cloud to mobile to big data. Tell me little bit about the potential. Haydon: Absolutely. When we think about the networked economy, the networked apps, the network-centric apps, the network itself, one should be able to connect any demand generating or receiving system. We touched on that with Dell Boomi, but it's seamless integration across the piece. We want to be comprehensive, which is adding more collaboration. The interesting thing about this collaboration, is it starts driving at some levels a critical mass of data. The trend is that the network is intelligent. It's actually able to piece together not just the transaction itself, but who you are. We're quite excited, because this is the massive differentiator of the network. You talked about apps. We have not just the transactional data, but we have the master data, and we can also take other sources of information. That could be weather, location, stock reports, SEC filings, Dun and Bradstreet writings, whatever you like, to intersect. So this data plus knowledge gives you information. With SAP, it's a very exciting technology. SAP InfoNet, Supplier InfoNet, is able to leverage network data. Today, it has over 160 feeds. It's smart, meaning it's smart intelligence. It can automatically take those feeds and contextualize. And that's the real thing we're trying to do -- knowing who the user is, knowing the business process they are trying to execute, and also knowing what they are trying to achieve. And it's bringing that information to the point of demand to help them make actionable, intelligent, and sometimes predictive decisions. The trend is that the network is intelligent. It's actually able to piece together not just the transaction itself, but who you are. Where we would like to go is, heaven forbid there is another tsunami, but let's just work through that use case. You get a news alert there is tsunami in Japan again, terrible event. What if you knew that, and what if 80 percent of your core, raw material inputs came from there? Just that alert of that to notify you to saying you've got to know that you might well have a supply problem. What are you going to do? And by the way, here are three or four other suppliers who can supply this material to you, and they're available on the network. What is that worth? Immeasurable.